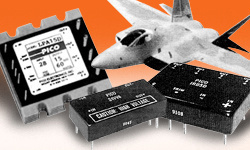 Pico Electronics, the leader in miniature power components, offers DC-DC Converters and AC-DC Power Supplies. Operating Temps: -55º to +85º; Vibration: Method 204, Cond. D; Shock: Method 213, Cond. I; Altitude: Method 105, Cond. D; 400Hz and 800Hz AC-DC models. Proudly made in the USA.